PAYDAY 2 was released without any warning, so I’ve been putting some time into it to see how it runs on Linux. I must say, I am pretty impressed with the port. I did a two hour livestream and it was extremely stable without a single crash. Not many bigger games are this stable right out the door for us, so I’m damn happy with that. Here’s a video of a mission I played offline, this is an entire mission played at 2560x1440 on High settings. Apologies for any noticable screen tearing, Compiz/Ubuntu really isn’t well setup for it. I have a startup script in place now thanks to Xpander that has helped somewhat. I look forward to seeing if Mir/Wayland help with tearing. The performance at 1080p on my 980ti has been really good, very smooth without a hint of sutter. That’s impressed me more than anything. I know I have a great GPU, but plenty of other ports don’t come close in terms of performance to Payday 2 for me. At 2560x1440 resolution the game runs reasonably well; it bounces between 60 and well over 100 FPS depending on what is going on. Sadly at 4K resolution the game says it has a high FPS, but I can feel the game being really sluggish, It’s just not playable (not many games are at 4K on Linux, so they aren’t alone). The game doesn’t have a benchmark mode so I cannot capture exact numbers right now without doing some trickery. I might do so in future, but I wanted to get some thoughts out on it before we tried any benchmarking on it. I’m surprised at just how much I am enjoying the game. I knew I would somewhat enjoy it since it’s an FPS and all, but I didn’t realise it would be as hilarious as it is. It has many features that I wasn’t aware of and a lot of those are sure to excite many linux gamers. It has full cross-platform multiplayer, so you can play with your Windows friends, or with random Linux/Windows users that join in your sessions. I had a pretty easy time finding people to play with since it’s still a very popular game. I haven’t seen it drop below 10,000 players online for a while, and thanks to the free play time it has been hitting over 20,000. The main appeal of the game for me is that it allows you to be on the other side of the fence. Instead of some anti-terrorist organisation, or an army, you are the robbers. It just feels more interesting and exciting to play as the bad guy. If you’re new I highly suggest playing with friends, or trying it solo for a while. The AI is a little dumb and it will end up being a little bit frustrating for you, so online is a must really. That said, people who have played it for a while tend to rage at you if you mess up even a little bit, as I found out. The basics of the game are really easy to grasp, as there’s no real difficult mechanics. Cracking open doors is a simple press of a button to get your drill out, for example. You still need to keep an eye on your drills as they will get jammed up, prompting the player to interact with them again. Alternatively, you can forget altogether by finding a hidden card key. There’s a lot of variation in the missions which will keep me entertained for hours. Some of that variation is thanks to the DLC packs, which add in different scenarios. All of which work on Linux as far as I can tell. I have shot up a mall doing as much damage as I can, which was great as the police eventually stormed the place and we had to get rescued by helicopter. We rescued someone from a downed helicopter and took their cocaine to make some money, and we had to keep shouting at the pilot every time he fell over or threw up. At one point Samsai was driving a forklift with bags of nuclear warheads, while I was casually sat on the back unloading clips at police firing at us. Why they thought it was a good idea to fire at us while we were carrying such explosives—I don’t know. There was also a time we stormed a meth lab, ended up cooking meth and tried to escape with it. Yes, all of those are actual missions. There was one annoying issue with the game only detecting the max resolution from my 1080p monitor, and loading into a tiny box on my 4K monitor. I managed to solve it by disabling my second monitor, loading it up at 4K on my main monitor and then enabling my second monitor again. Since then it has been fine. The developer responded to my report, so hopefully it will get fixed. The developers introduced microtransactions, which isn’t always a bad thing, but people didn’t like it. Mainly due to the developers originally saying the game will never have it, so people felt betrayed. Priorities for developers change, especially when you plan to support your game for far longer than originally planned. I don’t personally care as I don’t feel like it’s pay to win. I’ve seen bad reviews with things like this “if you are new do not buy it unless you are willing to spend more money on DLC's that will come out over time” (actual quote) which I find odd. Why is it such a bad thing? You’re not forced into DLC, and it again keeps games active way longer than they would have been originally. They are constantly on sale too, so it’s not like it’s expensive. To sum up, I think it’s a really interesting game to have on Linux, and performance is really good. Great for a bash with your friends, and still reasonably fun with random people who join in. It’s still free to try for a few days, so you have nothing to lose. 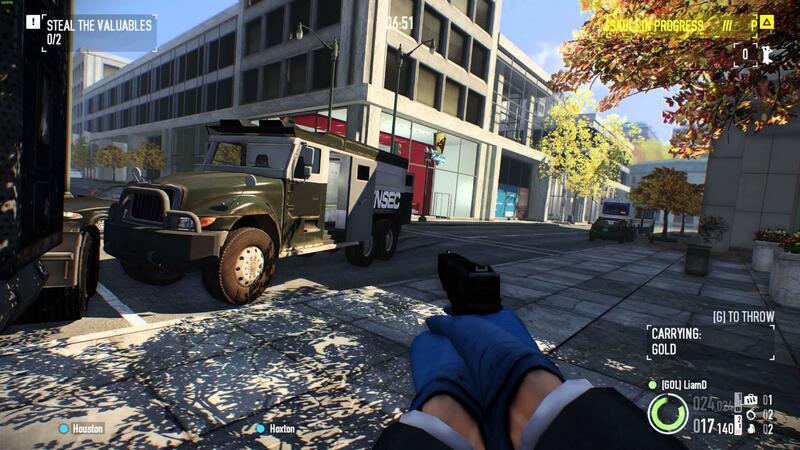 You can find PAYDAY 2 on Steam. It’s currently free to try, and it’s on a mega sale. We had some fun yesterday with GoL people as well. Chromatic aberration is strong with this one. Regarding tearing - I take it you've got triple buffering enabled? Doing so completely fixed all screen tear for me. Let me just repeat what Liam said - "The AI is a little dumb and it will end up being a little bit frustrating for you, so online is a must really." The singleplayer is unplayable and so if you're like me and have no time to dedicate to online play, then don't bother purchasing. Also worth mentioning that once the police get involved, it becomes a wave shooter worthy of the Left 4 Dead crown. An endless stream of police/fbi etc will throw themselves at you, I was racking up dozens of kills in missions. Each wave is harder than the last as the cops armour up. There's no standoff and I never once saw the police decide to setup a perimeter and send in a negotiator, they always charge in guns blazing, apparently ignoring the civilians caught in the crossfire. This, and more is why I personally was disappointed by the game. "I know I have a great GPU"
Damn Liam, back at it again with the bragging. GBee Let me just repeat what Liam said - "The AI is a little dumb and it will end up being a little bit frustrating for you, so online is a must really." While i agree that the game is best played with other people it is playable with or without AI when playing alone. I play stealth-missions alone and have had tons of fun doing that in addition to playing with friends. I occasionally play loud missions with bots on Very Hard / Overkill and use the bots as meatshields / revivers, not optimal but it works, you just have to herd the bots and keep an eye on them. Admittedly i have played over 800 hours Payday 2 now so i know where to go and what to do, starting out from zero and playing solo will have a steep learning curve and is probably not worth it unless you intend to mainly do stealth-missions. Sadly the game has some heavy performance issues for me on Linux, wildly fluctuating framerate and massive drops down into the teens. I'm hoping that they continue working on it and optimizing it because i really love this game and it's great to finally have it on Linux. It's an internal port by the developer as far as i know, so Overkill Software. In their press release they promise that "The SteamOS version of PAYDAY 2 will continuously be updated day and date with the existing Windows version of the game. ". An internal port is basically a requirement if cross platform multiplayer is going to work on a game that is still being updated.